Earlier this year, pets were flown from Oklahoma to be put up for adoption in Omaha and now more have arrived from other parts of the country. After flooding in the Carolinas and Florida, many pets were left separated from their owners so Hearts United for Animals , based in Auburn, took in more cats and dogs. 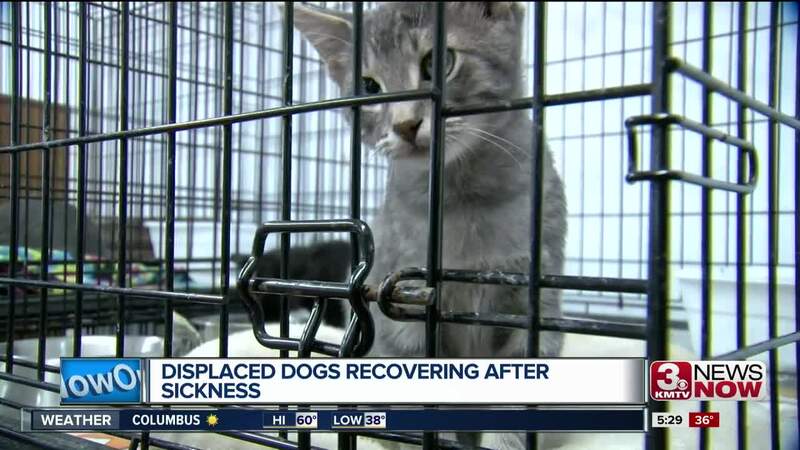 "We at first had thought wow we had a bunch of really great relaxed dogs but then we found out they were mostly sick which is sad and it's unfortunate but it happens with hurricane dogs whenever you are rescuing dogs that come out of a wet situation we see a lot of it," Hearts United general manager Kristy Francis said. "We really do." The pets from hurricane-affected areas arrived on Oct. 25. However, it was not without problems. Many of the dogs have a contagious upper respiratory illness that has delayed the adoption process for some. Because of the nature of the sickness, some also had to be quarantined. The good news is that all of the illnesses are treatable. "Some of them it's really a miracle that they are even here but we will spare no expense getting them back to good and finding them great homes," Francis said.